Despite rumors that Apple may be looking into extending its contract with AT&T, consumer perception for the carrier has dropped lower than it has all year. In a comparison of Verizon Wireless and AT&T consumer perception among adults 18 and older, goodwill toward AT&T has dropped precipitously compared to rival Verizon, according to daily YouGov BrandIndex data. Urban iPhone overload and data outages during the summer season may be to blame. BrandIndex measures “consumer perception” by averaging scores in response to questions about the quality, value, satisfaction, recommendation, reputation and impression of a brand. AT&T has always lagged behind Verizon Wireless, but the gap began widening noticeably in mid-June, according to the data. Between June 16 and Sept. 10, AT&T’s Index score dropped from 18.3 to 14.6, “a substantial drop for this kind of score,” a BrandIndex spokesman said. Verizon’s score dropped less than two points’ worth in the same time period. Drops in quality (”Is it high quality or low quality?”) and recommend (”Would you recommend the brand to a friend?”) scores contributed to the overall drop, according to the spokesman. YouGov’s BrandIndex interviews 5,000 people each weekday from a representative U.S. population sample. Respondents are drawn from an online panel of more than 1 million individuals. Margin of error is +/- 2 percent. For AT&T, the benefit of success that comes as the exclusive carrier of the iPhone may very well also be a burden. Amid press reports that AT&T's network is having trouble keeping up with its customers' data usage (directly related to the iPhone adoption), company perception among adults has dropped steadily over the summer, according to YouGovPolimetrix's BrandIndex, which measures daily consumer perception of brands. "There's been a significant amount of high-profile press in the past couple of weeks about AT&T's data problems," Ted Marzilli, CEO of YouGovPolimetrix, tells Marketing Daily. "There's no question it implies that there are some serious concerns for AT&T and Apple as they consider [extending the exclusivity of] the iPhone." According to the company, AT&T's "Index" score (which is the average of its Quality, Value, Satisfaction, Recommendation, Reputation and Impression scores) has been dropping since mid-June. On June 16, the company's Index score was 18.3. By Sept. 10, it had dropped to 14.6. (By comparison, Verizon Wireless' score on Sept. 10 was 21.2, about the same as it was at the beginning of the year.) The company's biggest score drops were on the Quality and Recommend scales, suggesting that stories addressing data outages were having an effect on company perception. "I think there's still only a small number of people who've given up the iPhone and AT&T," Marzilli says. "I think there's a larger number of people who want to buy an iPhone, but are hesitating because of these problems with AT&T's data coverage." In the meantime, some damage control may be in order for AT&T [such as] putting together a plan to tell the public how they're going to address the problem and a timeline for putting it into place, Marzilli says. "AT&T has to work very, very hard to make sure those [iPhone] subscribers are profitable and happy, particularly before the exclusivity agreement runs out. Because once they leave, it's going to be very hard to get them back." Since the launch of the iPhone 3GS, public perception of AT&T has progressively decreased, while opinions about competitor Verizon Wireless remained relatively unchanged, a new study shows. In a daily survey of 5,000 people 18 and older, YouGov's BrandIndex tracks companies based on factors of quality, value, satisfaction, recommendation, reputation and impression. When combining those categories, AT&T's index score of 18.3 on June 16 had eroded to a 14.6 on Thursday -- a change company senior vice president Ted Marzilli told AppleInsider is "statistically significant." issue can be traced to the launch of the iPhone 3GS -- or, more specifically, the network's inability to meet the bandwidth needs of users with the device. "It may be hindering iPhone adoption at this point," Marzilli said, "and I think Apple is going to take a hard look at what they will do next." AT&T has always been perceived as an inferior brand to Verizon Wireless in the index rankings. However, it was in mid-June that the gap between the two companies began to widen. Though AT&T's 14.6 score in overall feedback remains relatively positive, it still lags behind well behind Verizon in consumer perception. In the last three months, AT&T's biggest hits came in the quality and recommendation rankings. "AT&T can come out with its initiatves and its announcements, but the problem is people on the Web are starting to blog about their problems with the AT&T network," Marzilli said. "It's a bit of a snowball effect." While the study found AT&T's score to consistently drop over the last three months, Verizon has stayed much the same as it was in January. Its Sept. 10 score was 21.2. Scores can range from 100 to -100. A score of zero would mean equal positive and negative feedback. per year from an online panel of more than one million individuals. The company said its survey's margin of error is +/- 2 percent. NEW YORK While it was certainly a coup for AT&T to get the exclusive rights to the Apple iPhone, the agreement hasn't been entirely positive for the wireless giant. Consumers who flocked to AT&T to use the device were disappointed with the quality of the service, according to new findings from YouGov's BrandIndex. AT&T's perception among adults over the age of 18 has steadily eroded throughout the summer, while Verizon Wireless has retained its standing, per an online poll of 5,000 consumers. Consumers were asked to rate quality, value, satisfaction, recommendation, reputation and impression to generate an overall index score. Thanks to drops in the quality ("Is it high quality or low quality?") and recommendation ("Would you recommend the brand to a friend?") rankings, AT&T's index score fell to 14.6 as of Sept. 10. That was down from 18.3 on June 16 and is considered a substantial drop for this type of index, per YouGov. "For AT&T, it's beginning to look like a case of 'be careful what you wish for' with its overloaded network and dropped calls," said YouGov svp Ted Marzilli. "While there are no other options for iPhone users, BlackBerry's new ultra-competitive products and two-for-one deals at Verizon Wireless may make both Apple and AT&T vulnerable to 'iPhone flown.'" 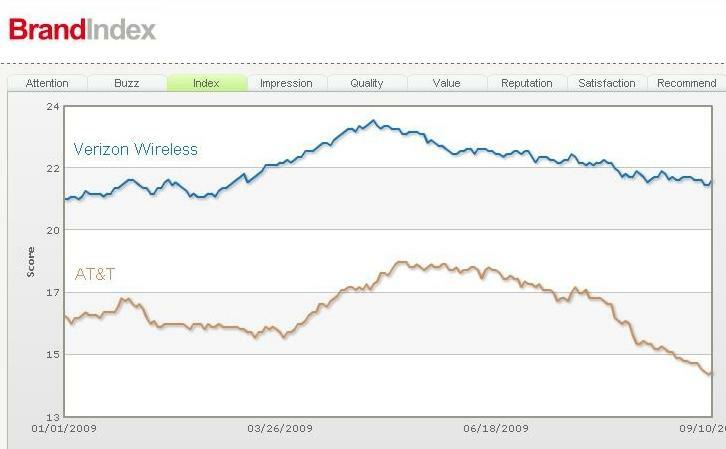 Verizon Wireless' index score on Sept. 10 was 21.2, which is consistent with its rankings throughout the year. AT&T rep Jenny Bridges said the survey is off base. "We continue to have low churn rates, which can be attributed to the fact that our customers are pleased with the services we're providing them," she said. "We care about the experience customers have with AT&T. That's why we continue to invest billions of dollars a year in making network improvements, including the continued launch of our 3G wireless services in markets across the U.S. and the launch of HSPA 7.2 in six major markets by the end of this year." "Since the launch of the iPhone 3GS, public perception of AT&T has progressively decreased, while opinions about competitor Verizon Wireless remained relatively unchanged, a new study shows," Neil Hughes reports for AppleInsider. MacDailyNews Take: For the umpteenth time: Take those 10+ million U.S. iPhones off AT&T and plop them on Verizon and watch AT&T satisfaction soar (especially in metro areas) and Verizon come to a grinding halt. No carrier, including Verizon's, is ready for 10+ million devices that are actually used for serious data consumption. Verizon's network accommodates inferior devices that only sip data in comparison to iPhone due to their unusable web browsers (if they even have them) and generally indecipherable user interfaces which, only benefits the carrier as they get to sell phones on features that most people will never use. The iPhone's ease-of-use (snap a photo or even shoot a video and send it over AT&T's network to wherever; robust, real Web Browsing; data-consuming apps which include streaming video over 3G, etc.) combined with the vast, rapidly-growing number of iPhones would cripple any carrier. If AT&T can't get a handle on it, Apple would do well to reconsider their exclusive U.S. arrangement and spread the wealth - and the data consumption - to other carriers, as soon as (technically and legally) possible. Hughes continues, "In a daily survey of 5,000 people 18 and older, YouGov's BrandIndex tracks companies based on factors of quality, value, satisfaction, recommendation, reputation and impression. When combining those categories, AT&T's index score of 18.3 on June 16 had eroded to a 14.6 on Thursday... [YouGov's senior vice president Ted Marzilli] "suggests the issue can be traced to the launch of the iPhone 3GS -- or, more specifically, the network's inability to meet the bandwidth needs of users with the device." "While the study found AT&T's score to consistently drop over the last three months, Verizon has stayed much the same as it was in January," Hughes reports. "Its Sept. 10 score was 21.2. Scores can range from 100 to -100. A score of zero would mean equal positive and negative feedback." MacDailyNews Take: No wireless network was ready for Apple's revolution which brought 10+ million of devices that actually use copious amounts of data coming online within a few short years. Of course, AT&T is struggling with it. Any network would. Especially in the U.S. where the land mass is huge and the terrain varied. Suffice to say, it's much easier to properly cover Belgium*, for just one example (hold the emails, we love Belgium, send beer instead! ), than the entire United States of America. AT&T is somewhat unfairly paying the price in perception when any wireless carriers' network would show similar strains. As usual, Apple is pushing forward, disrupting the status quo. It's not pretty, for AT&T especially, but Apple has caused a paradigm shift in mobile computing and more rapid mobile network improvements will come from it. All that said, the market will take care of this by either forcing overwhelmed AT&T to keep the pedal to the metal and press even harder if they want to keep U.S. iPhone exclusivity or, if AT&T's can't or won't rapidly improve their network capacity/coverage, causing Apple to pursue a non-exclusive U.S. carrier strategy lest iPhone sales and brand perception begin to suffer. * Belgium is about about the size of the state of Maryland.